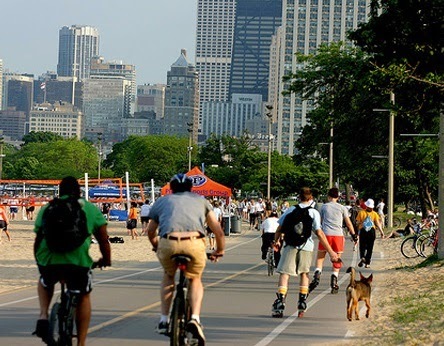 The claim for a Chicago bicyclist who was injured on Chicago's Lakefront path when a jogger ran into her has been settled for $125,000.00. The incident occurred on August 22, 2012 as the bicyclist was riding and the jogger was running along the path. As the bicyclist maintained a straight path, the jogger inexplicably turned right into the path of the bicyclist. The bicyclist instinctively took sharp evasive action to avoid colliding into the jogger and, in doing so, lost control of her bicycle and crashed to the hard pavement of the path. The bicyclist hit the ground with such force that her Giro Indicator Helmet cracked. Worse, the bicyclist's right collarbone was broken and her shoulder was sprained as she put out her arm to brace for the impact. A fractured collarbone is a very common injury suffered by bicyclists involved in a bicycle accident. A City of Chicago ambulance was called to the scene and took the severely injured bicyclist to the emergency room at Advocate Illinois Masonic Medical Center. At the hospital the bicyclist was diagnosed with the mid-clavicle fracture and right shoulder sprain, injuries that required shoulder surgery to properly correct her injuries. After the surgery the bicyclist was unable to bear any weight on her right arm for two months. Claims involving pedestrians or runners are often very difficult because, unlike with bicycle accidents involving motor vehicles, there often is not insurance coverage for incidents between pedestrians and bicyclists. While most people who have a car carry automobile insurance coverage, few people have insurance coverage through an insurance policy that covers other kinds of accidents. Complicating matters in this case was the fact that the police report contained very little information regarding the identity of the jogger. Again, unlike a bicycle accident involving a motor vehicle, there was no Illinois Motorist Report or Illinois Traffic Crash Report that routinely lists the name of the driver and their insurance company. 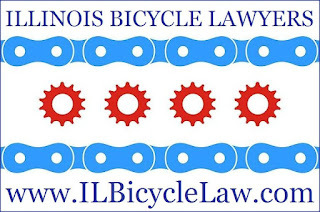 Following the bicycle crash, the bicyclist retained the Illinois Bicycle Attorneys at Keating Law Offices to represent her. However, due to the nature of the case the name of the jogger remained unknown. In order to obtain this information, the Illinois Bicycle Lawyers filed a lawsuit against "Jane Doe" and then subpoenaed the entire police file on the incident. Fortunately, the police officer in this case did fill out a basic incident report with some details. With cooperation from the Chicago Police Department, the name of the jogger was found and a private investigation service was able to locate a last known address for the jogger. The jogger was ultimately located and her insurance company was identified. There was initially an argument that this was a pure "accident" and that no one was to blame. However, legal analysis comparing the duties of the bicyclist and the runner shows that is not the case. The bicyclist appropriately maintained a straight path as she traveled and kept a proper lookout for other bicyclists and runners on the path. The jogger, however, did not maintain a proper lookout and actually violated a relatively obscure law that imposes specific duties on a pedestrian, in this case a jogger. Section 9-60-120 of the Chicago Municipal Code imposes an explicit duty on pedestrians, whether walking or jogging, to exercise due care. Under this provision, the jogger was required to exercise sufficient care to avoid causing harm to others. After negotiations with the insurance company, the Illinois Bicycle Lawyers reached a very favorable settlement on the bicyclist's behalf that paid for all of her medical treatment and compensated her for pain and suffering, lost wages, the surgical scar on her shoulder, emotional distress, and the loss of a normal life during the two months it took her to recover. Keating Law Offices has previously helped an injured bicyclist obtain a personal injury settlement for a bicyclist injured on the Lakefront Path. Keating Law Offices is the premiere law firm handling bicycle-related cases in Illinois. 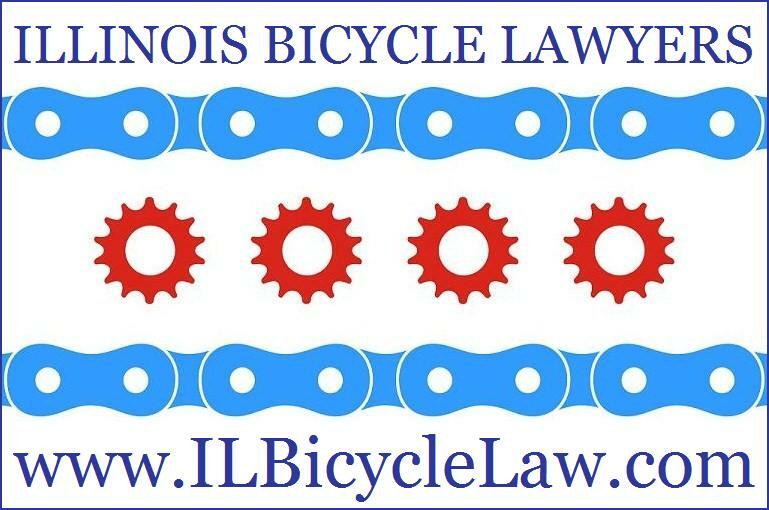 The firm is committed to the representation of bicyclists in Illinois. If you have any questions regarding this post or an issue involving Illinois personal injury law, please contact Illinois Bicycle Attorney Mike Keating at 312-208-7702 or MKeating@KeatingLegal.com 24 hours a day, 7 days a week. All e-mails and phone calls are returned promptly. All initial consultations are confidential and free.